I’m a sucker for Reese’s Pieces. I don’t want to say that a certain movie with a loveable alien changed my life, but maybe it did. This snack is like puppy chow on steroids. It’s just as simple and just as addicting. I would suggest using either pretzel sticks or the snaps, but really use whatever you prefer. The original recipe calls for more white chocolate, but I didn’t really miss it. Oh, and make this as often as you can, it’s going to go as quickly as you make it. 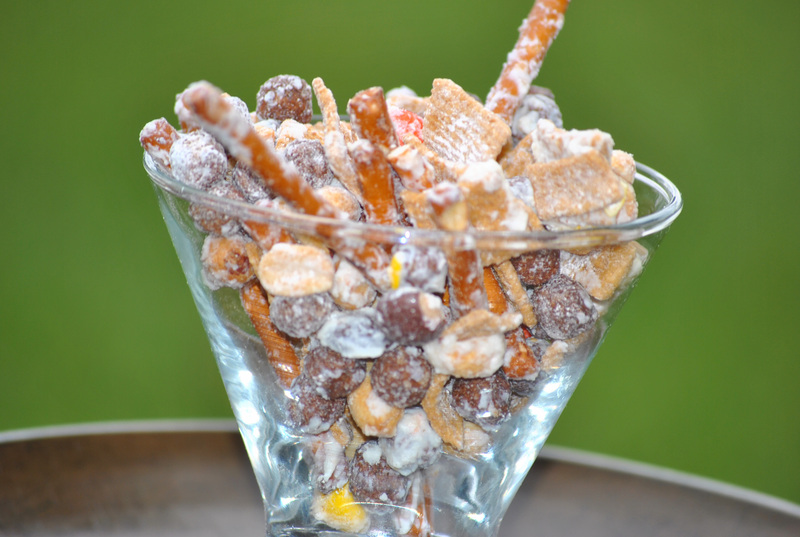 In large bowl, mix cereals, pretzels, peanut butter candies, peanuts and powdered sugar; set aside. In a microwavable bowl, microwave white chocolate and butter uncovered on high about 1 minute, until melted and chocolate can be stirred smooth. Pour over cereal mixture, stirring until evenly coated. I but the lid on the container and toss. Store tightly covered at room temperature. This is another recipe I found via Pinterest. Here’s the original. Cathy talked about making the cake with orange and cranberry. She loves that combination. I’m not sure if she’ll make it for Thanksgiving, but I’m sure if she did it would be a hit. I made the cake with the pumpkin. 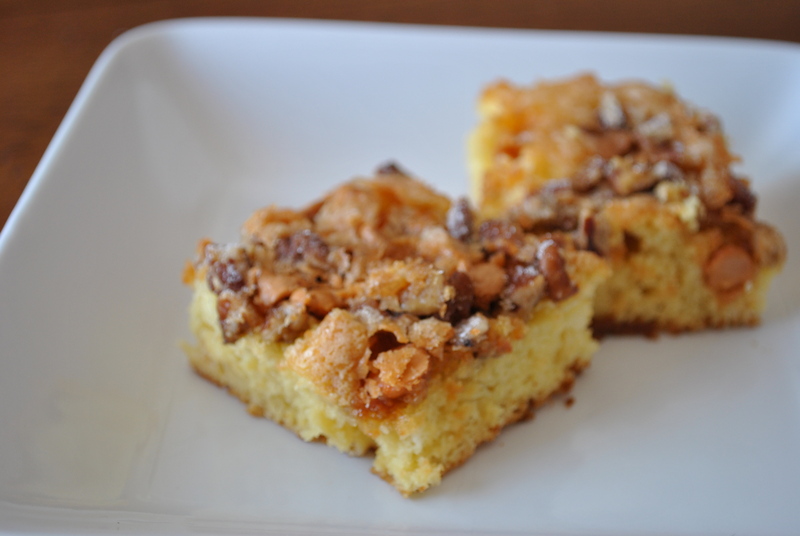 I loved that I could just through the ingredients together so quickly. I made this before work the other morning and just loaded it into the car. The smell during my commute was heavenly. My only complaint is that I don’t have a picture of the new cakes. What variation can you think of? What about the chocolate cake mix? Mix the pudding as directed and let set. Add the cake mix and eggs to the pudding. Mix until blended and pour into a greased 9 x 13 pan. Mix the ingredients together for the topping, sprinkle on top of the cake. Bake for 30-35 minutes. Mix the pudding as directed and let set. Add the cake mix, eggs and pumpkin puree. Mix until blended and pour into a greased 9 x 13 pan. Mix the ingredients together for the topping, sprinkle on top of the cake. Bake for 30-35 minutes. Mix the pudding as directed and let set. Add the cake mix and eggs to the pudding. Add the orange zest and mix until blended and pour into a greased 9×13 pan. Mix the ingredients together for the topping, sprinkle on top of the cake. Bake for 30-35 minutes. I love a good snack. I especially love one that’s easy to make but also twisted. Take these pretzels. They are so good. Meeshie and my husband can’t stop eating them. It’s that salty sweet thing. These are not only a perfect snack, but a perfect gift. Put these in a mason jar with a bow and give it to your child’s teacher. Or give as a hostess gift. Put these out during a party and see them disappear. Truly, the hardest part of making these is deciding the pretzel shape. Mix it up by halving the white chocolate and using some milk chocolate too. Or sprinkling with red and green sugar for holiday cheer. But let’s not forget the wonderful aroma of the cinnamon. This snack smells as good as it looks. That’s probably why it moves out of the house so quickly. Whisk together oil, sugar, and cinnamon. 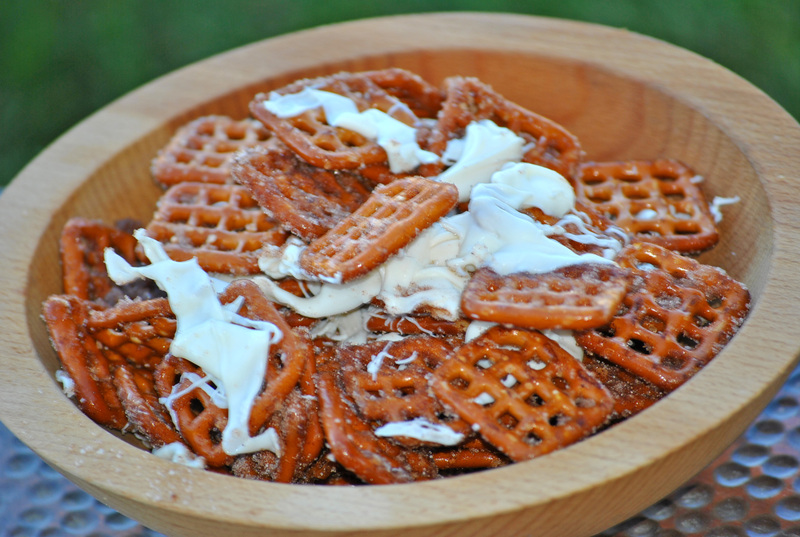 Pour the pretzels into a microwave safe bowl and pour oil mixture in. Stir until coated. Microwave for 1 minute, remove and stir. Microwave 45 seconds more. 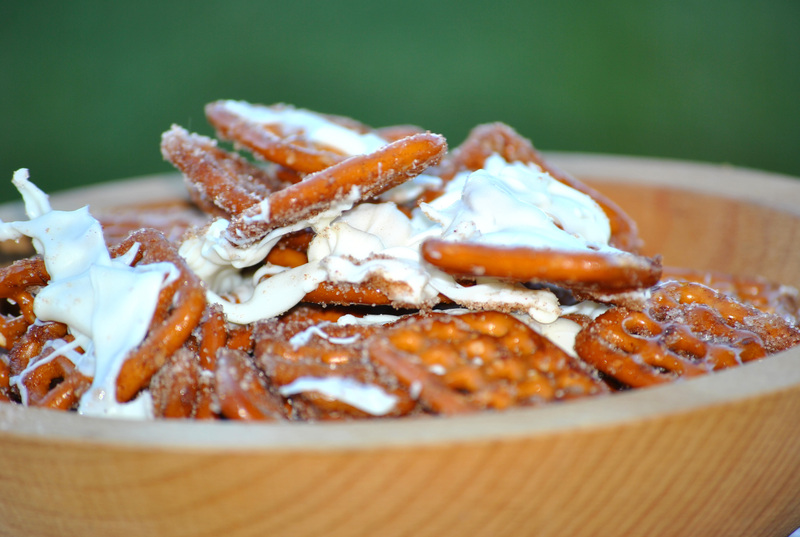 Spread pretzels evenly onto two cookie sheets covered in parchment paper. While still warm, sprinkle cinnamon sugar generously. Pour the chocolate in a microwave safe bowl and microwave at 30 second increments until melted. 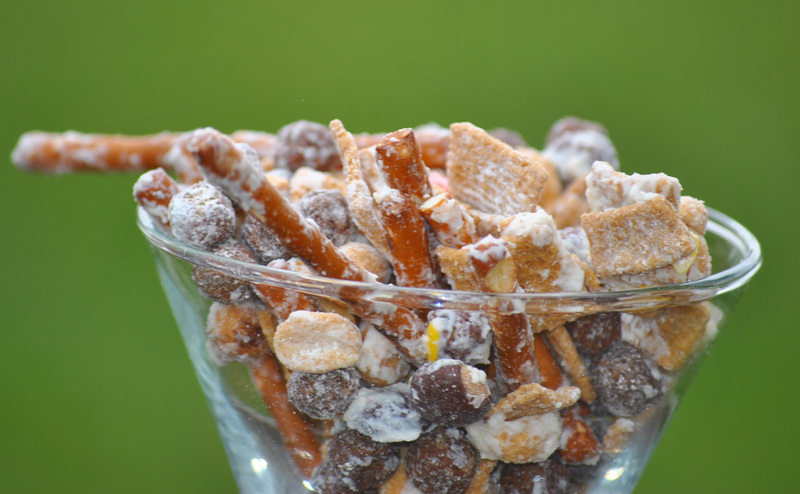 Drizzle over cooled pretzels. You are currently browsing the Meeshiesmom's Blog blog archives for October, 2012.